Education is a swift-moving stream. Fall out of the current, and it’s easy to be left behind. Bruce Savoie knows this better than most. 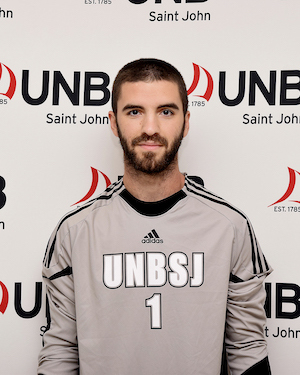 The 26-year-old University of New Brunswick student and keeper on the UNB Saint John soccer team has just been named a Canadian Collegiate Athletic Association Academic All-Canadian, the organization’s most prestigious award. Mr. Savoie left high school but later got his GED. In 2010, he started at UNB’s Saint John campus and hit another rough patch, struggling before leaving the university. He learned a trade, autobody repair, but a workplace injury made him rethink the work. Now married, he returned to UNB with a renewed focus. “My wife does a lot for me and our son. I couldn’t justify not doing well,” said Mr. Savoie. He returned to university part-time in the general studies program in 2012, was accepted into Arts the following year, and applied for the concurrent Bachelor of Education degree, pursuing an old dream to become a guidance counsellor. Mr. Savoie’s Academic All-Canadian award is the latest honour in a year where everything is coming together for him in class and on the pitch. The award is granted only to students who have achieved simultaneous excellence in athletics and academics. His other awards include a CCAA National Scholar Award, ACAA First Team All-Conference Keeper of the Year, the Seawolves 5-Year Award, UNB Associated Alumni Watch and the Student-Athlete Advisory Council Leadership Award. Mr. Savoie views his athletic pursuits as a necessary part of his success, a way to keep himself level and organized. His path to this point has been unconventional, but Mr. Savoie hopes that it can be an example. Photo: UNB Saint John’s Bruce Savoie suits up as Seawolves’ soccer keeper.